The end of June marked the end of MG Awareness Month 2013. 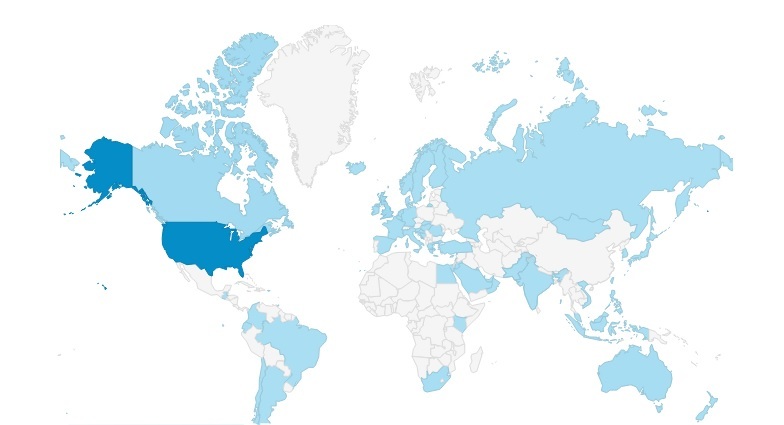 During this past month, we received 6,607 visitors to this website from over 62 countries! United States, United Kingdom, Canada, Australia, Greece, South Africa, Germany, Singapore, Colombia, New Zealand, Belgium, Philippines, Denmark, Spain, India, Netherlands, Sweden, Cyprus, Slovenia, Slovakia, France, Jordan, United Arab Emirates, Egypt, Hong Kong, Ireland, Saudi Arabia, Taiwan, Italy, Japan, South Korea, Norway, Puerto Rico, Romania, Bosnia and Herzegovina, Croatia, Hungary, Pakistan, Argentina, Brazil, Chile, Ecuador, Finland, Guernsey, Guatemala, Indonesia, Iceland, Jersey, Kenya, Kuwait, Cayman Islands, Lebanon, Luxembourg, Mongolia, Malaysia, Oman, Qatar, Russia, Turkey, Trinidad and Tobago, and Vietnam. I want to say a huge THANK YOU to our members that sent in their personal stories to be shared, to everyone that “liked” and “shared” the posts on Facebook and other social media, and to everyone that visited the site this month. I am especially appreciative of the WWMG members who submitted their personal stories to share with the world and helped us put faces with the facts. Due to MG issues of my own, I, regrettably, was unable to get all of the personal stories that I received, posted during the month of June. So we discussed it as a group, and we decided that since we have MG all year round, we would keep the awareness going. My goal is to post approximately one new personal MG story per week. We can keep this going for as long as we have stories to share. As of this moment, I have nine more personal stories awaiting publication here. Keeping the personal stories going, also allows some of our members who wanted to share their story (but their own MG got in their way), the time to write and submit their stories as well. I also am planning to add a great deal more information to this site that will be helpful to MG patients directly. So, that is some of what we have planned for the future here at WWMG. If you would like to receive email notifications of new posts made here, you can enter your email address into the subscription field on the left-hand sidebar. If you subscribe, please make sure that you “confirm” your request (via an email confirmation that is sent to the address you used when you signed up. This is to make sure that we aren’t emailing anyone that doesn’t want to be emailed). If you do not confirm, the automatic system cannot send you the notifications you requested. Again, thank you to everyone who helped us make this a very successful MG Awareness Month!